Yesterday BD at Watershed practically begged me to help out with some field work this week. At first I told him there was no way I could because I had to get a draft of my thesis out to my committee by Friday but he looked totally desperate so I agreed to switch my work days around and do it for him. To my surprise I ended up working with Nate Meehan all day. We had to lay out black tarps in 50x50 foot squares in different areas of the forest representing different canopy types. The black color is used to calibrate hyperspectral sensors that our company will be flying with shortly in Alaska I believe. This was cool because i knew exactly what and why we were doing it from my remote sensing background in graduate school. Finding the right areas and hiking the tarps, wooden stakes and other gear in took a while but setting it up didn’t take that long. The 2nd one we set up we had to clear an area of underbrush that took a while. I used an ax to chop down a ton of smaller trees and lower vegetation so we could stretch the tarp out for better coverage and visibility from the air. The whole day took 12 hours and I was home by 5pm (so guess what time we left ..). It was a beautiful day and we were afforded some nice views of the distant volcanoes. 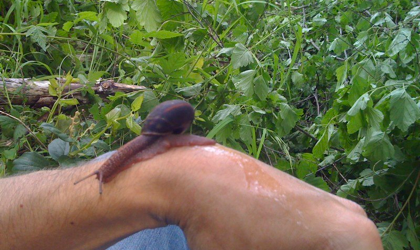 I also found a massive snail which to my surprise wasn’t scared of me at all. Back at home I was pretty tired so popped a movie in to relax after a physical day of work and I had no plans on going in to Watershed again until I successfully defend my research next Friday.